This is just a quick post to remind you visit your OB-GYN and have your breast examination! As you all know, October is the Breast Cancer Awareness month. 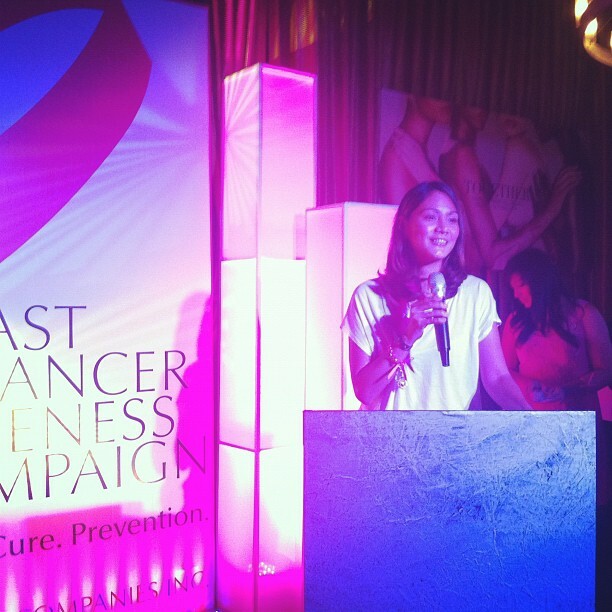 I was reminded of this because of the event I went to yesterday, Estee Lauder's Breast Cancer Awareness Campaign. I was moved by the talk of Ms. Patty Betita wherein she shared her life-changing experience when she was diagnosed with Stage 1 Breast Cancer three years ago. She spoke of her struggles and how she felt blessed that her doctor detected her cancer at its earliest stage making the operation, treatments and recuperation faster and her quality of life did not drastically change. She is now cancer free and enjoying her life with her son. She recommends that we women, even men, to visit our doctors to get checked out for breast cancer. After her talk, I felt so lucky to be alive and promised that I would be more vigilant with my doctor's appointments. If Breast Cancer is detected early, there is a great chance that it is curable. A great chance of survival and a greater chance to enjoy life with your loved ones. This is no joke, if we can spend thousands of pesos on beauty products, clothes and fine dining.. getting your breast exam is easy enough to do. Here's a message from Elizabeth Hurley, breast cancer advocate. Here are the women of Estee Lauder Philippines who made this event possible last night. Thanks, ladies. The night was really enlightening. You can also do Breast Self-Examination on yourself. Visit Breast Cancer Foundation website to find out how to do breast self examination. Let's help Estee Lauder and spread the Pink Ribbon Movement. Wear a pink ribbon today! but wishing ill of others who do negative things isn't a positive avenue to take. i take offense of what you said since i know fashionpulis and whatever he says on his blog doesn't speak of his personality. he also helps out others. if my comment offended you, then know that i am sorry. bullying begets bullying. and the only way to stop it is to ignore or stand up to it in a good way. we can't stop people from saying what they like. we were not born with a funneling system. all we can do is try.